tested water yest and nearly fainted when i saw the colour that came up. PH6!!!!!!!!!!! OH MY GOD!! my poor guppies, danios etc!! what the hell am i gonna do?? gonna get sum coral sand. how slowly must i add it? how much at a time? that will help long term. if it's a medium bag, you can add it straight in., if you want to get a big one, add 1/2 then a few days and a pH test later the 2 half. remove as much of the wood as you can (leave a tiny bit for the plec tho). when was the last pH test and what were the results? p.s no wood in tank. was saving it for that big tank i bought but as u know it's not usable now and the guy atill hasnt refunded me or fixed it! check if the filter to see if it's cloged with muck? if it is, clean out in a bit of old tank water. I have found that seashells will help keep up the ph of a tank, they keep breaking down or emiting it as long as their in the tank. Hope this helps some, it is a slow process, but may help in the long run so you dont have it drop so low again. thats a damn shame cos loads of people keep neons and danios and guppies all together! (me included what are the signs for when the ph is bothering a fish? irritation, extra prone to disease, not breeding, not feeding well, not looking great and things like that. mind that individual fish can live in the pH range outside their own quite happily. if you have the pH around 7 everyone should be feeling quite well. And it's just done this all of a sudden? The tank we've got the snails in had a piece of cuttlefish in it - that crumbles quite quickly if that's any help. Was it well though, as it can be a bit salty. Sorry I am late in here but please, please don't rush, don't jolt that pH back up, you,ll do more harm than good. What is the pH of your tap water? If it is higher than your tank at the present then water changes are the way to go. Dumping any sort of agent in there to bring it back up can and most probably be to truamatic for your already stressed fish. just thought i'd meantion this, it has happened before (see another post somewhere here) last time (if i remember correctly) the pH droped to about 5. tap water pH was normal as well as all other readings. no, last time my PH rocketed to 8.5/9!! it was higher than a marine tank! now its plummeted. mike, the fish dont seem stressed in the least.. they eat like pigs. everytime they see me they swarm at the surface expecting a treat! they steal the plecos food after they've dmolished their flakes! sometimes i dont think the pleco gets enough food but i dont know what to do cos if i put extra in they eat that too! actually, thats a problem too... how can i get pleco to the food without it being pached by these greedy buggers? they get fed plenty, twice a day. 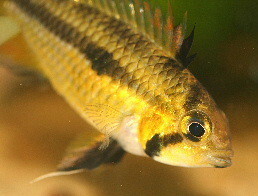 also, the guppies are still breeding, the males dont ever leave the females alone.. and the neons have grown SO BIG! even a friend who saw them when i got them commented only yesterday on how massive they are!